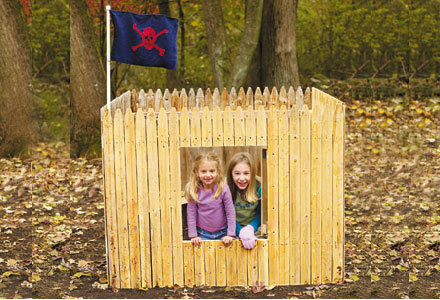 This fort from This Old House makes me almost wish I had another boy. Actually it just makes me wish the one I have was younger. If you have a boy that needs a fort, you can check out the directions for this DIY fort HERE. That is sooo cute!!! Now off the ask Papa to get started on yet another project for the grandchiladren. Cute! My kids would so love this!!! Love this! I think it would be really neat in a corner of the yard, so that two sides would be the "real" fence.